He spreads out his tail feathers and then he's all dressed! Wonder what he'd look like if his feathers were spiked? He's a beauty. Should have linked up to Angela's Show and Tail with this one! Ha! Miles is a doll. I think I'm in love. Wow! That is a spectacular bird! I lost my white male peacock last year. I do miss him so much--they are in some ways even more beautiful than the ones with colored feathers. Wow!!! What a beauty Miles is! I have never seen a solid white peacock. Thanks for sharing that. what a beauty! the albino ones don't even look real, do they!! NICE! Miles is breathtakingly gorgeous! I've never seen an all white one in person, just in pictures. I'm sure he brings great joy to those who get to see him in person! Such a beauty or should I say handsome peacock! OH MY GOSH!!! I love Miles!!! 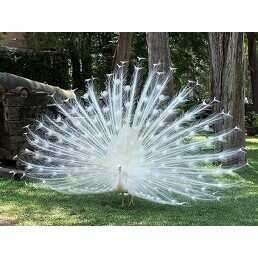 He is gorgeous and look at those tail feathers--he must be at least 3 or 4 years old with such a grand spread.